The Cassini spacecraft catches Saturn's moon Daphnis making waves and casting shadows from the narrow Keeler Gap of the planet's A ring in this view taken around the time of Saturn's August 2009 equinox. 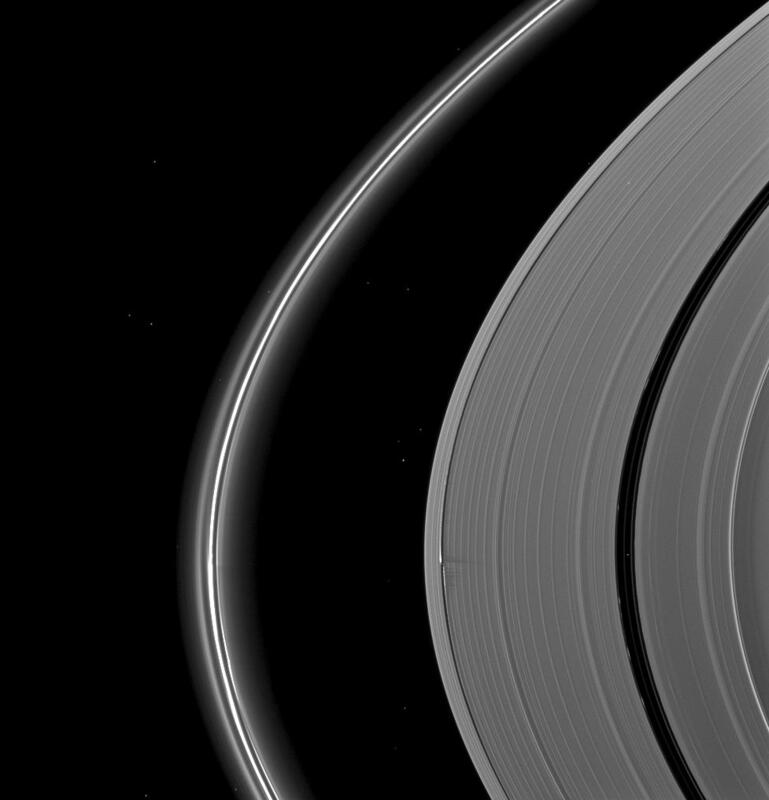 Daphnis (8 kilometers, or 5 miles across) is almost invisible in this view, but the shadows cast on the wide A ring can be seen below the center of the image. The Enke Gap of the A ring, which is wider than the Keeler Gap, is on the right. 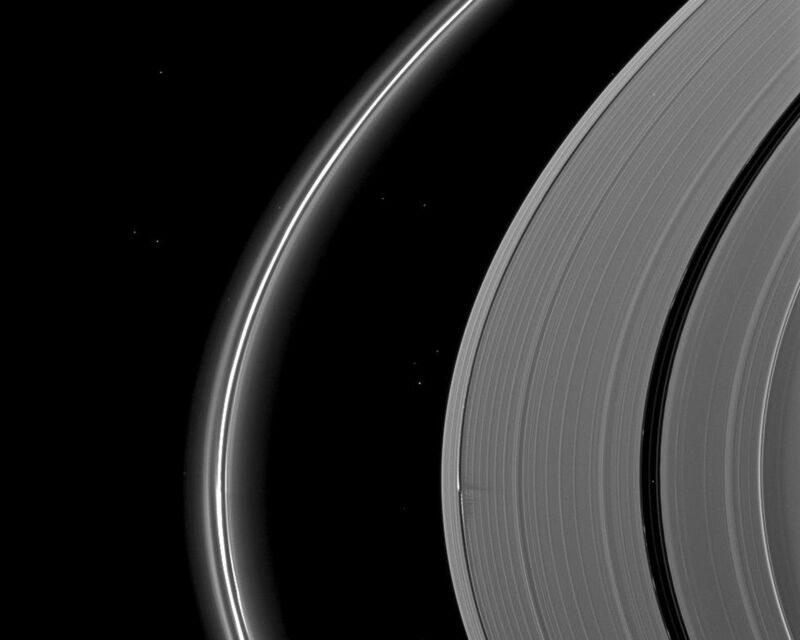 Saturn's thin F ring is on the left of the view. See PIA11629 for a similar, closer view. More than a dozen background stars are visible in this image. 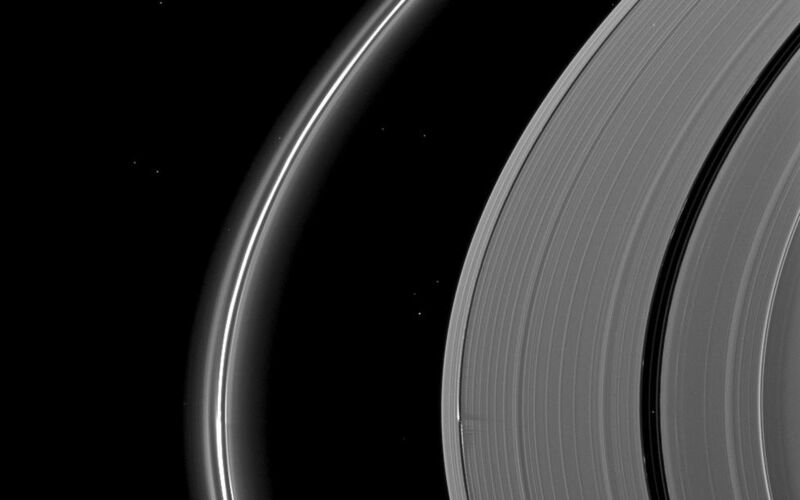 Daphnis has an inclined orbit and its gravitational pull perturbs the orbits of the particles of the A ring forming the Keeler Gap's edge and sculpts the edge into waves having both horizontal (radial) and out-of-plane components. Material on the inner edge of the gap orbits faster than the moon so that the waves there lead the moon in its orbit. Material on the outer edge moves slower than the moon, so waves there trail the moon. See PIA11656 to learn more about this process. This view looks toward the northern, sunlit side of the rings from about 13 degrees above the ringplane. The image was taken in visible light with the Cassini spacecraft narrow-angle camera on Aug. 16, 2009. The view was acquired at a distance of approximately 2.1 million kilometers (1.3 million miles) from Saturn and at a Sun-Saturn-spacecraft, or phase, angle of 108 degrees. Image scale is 12 kilometers (8 miles) per pixel.